Literally, this course will teach you how to not get eff’d at tax time. Don’t get blind sided by a tax bill you can’t afford and understand what receipts you need to keep to write off business deductions. The first of four Sole-Prop SchoolTM courses, this is the keystone. The building block of your sole-proprietor financial universe. Don’t get blind-sided by a tax bill you can’t pay and learn what receipts you need to be keeping! This is a MEGA resource and life-saver for tax time preparations. A customizable tool (spreadsheet obvs) that you can use each year to project out how much money you need to save for tax time as your business grows and changes. 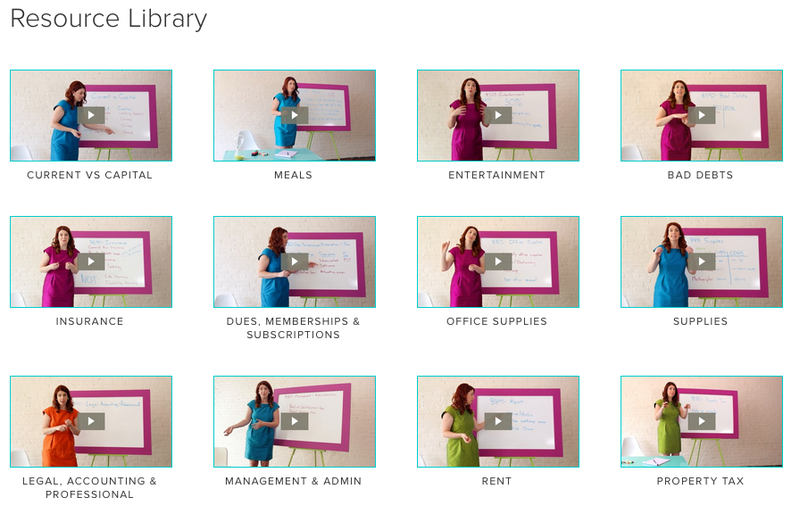 Access to the ultimate EXPENSE RESOURCES LIBRARY. We break down each tax category is a quick video that explains what the category is, how it’s calculated on taxes and modern day examples of what will and won’t work as a biz expense (i.e. you can’t write off your daily coffee). See screencap below. You can refer to this whenever you want throughout the year and during tax time while you’re prepping your taxes! How will this save me money? The more you know about how much you can legitimately deduct at tax time, the less tax you’ll pay. In addition, knowing how much you need to save for tax time will help you save up enough so you don’t have take on debt to pay your taxes or get charged interest for not paying on time. I have a tax professional, do I still need this course? It’s great that you have a tax person. WOO HOO! But, your tax professional isn’t liable for what goes through on your taxes (BLOW MIND). So, if you fill out their form and they put it through on your taxes, if you fill out their form wrong, you’re still doing taxes wrong and still could be in trouble with CRA if they come a’calling. So, taking this course will teach you about keeping receipts, what counts, what does not so that during the year you’re being PROACTIVE and keeping the right things so that the info that you hand your tax person is RELIABLE and LEGIT. i.e. you put through your daily coffee in the MEALS portion and send off to your tax professional. They put it through. Boom. Naaat good. Unless your tax person is going through your receipts one by one (this would cost you hundreds to pay them by the hour) you are running the risk. Know your shiz! Only you can prevent forest fires. I have a bookkeeper, do I still need this course? Depends. Are they certified as a professional they probably got this stuff on lock down. If they are an not formally trained, they may be following some urban tax-legends out there. Just like your tax professional, your bookkeeper is not on the hook for incorrect info. So, at the end of the day, the work comes down to you. Every time you make a purchase YOU need to know if something is a business expense or a personal expense FOR REAL. That’s where the work happens. Shannon is a Certified Financial Planner (CFP), Chartered Investment Manager (CIM), media personality, personal finance expert and founder of the New School of FinanceTM. She loves helping everyday people survive the new economic climate through personal finance, ethical investing and small business advice. Simmons is widely recognized as a trailblazer in the Canadian financial planning industry and an expert in Millennial personal finances and the digital world and it’s relationship to our money. She was named one of Canada’s Top 30 Under 30 and she recently won the 2014 Notable Award for Best In Finance. She is a regular financial expert on CTV News and also appears as a financial expert in the media, a regular contributor for Toronto Star’s Money Makeover and BBC Capital and host of Coral TV’s Money Awesomeness. Shannon travels across the country speaking for some of Canada’s largest corporations and universities including IBM Canada, The Canadian Women’s Foundation, University of Toronto, Ryerson University and Bishops University to name a few. This course is not financial or tax advice. The information in this course is for educational purposes only. The information in this course does NOT replace the information in the Income tax act or it’s Regulations. For all Quebec residents, the information given in this course is federally oriented and may not take specific tax differences for Quebec into account as Quebec residents may be subject to specific rules that are outside the scope of this course. We invite you to get in touch with us at info@newschooloffinance.com for more information before you purchase to confirm whether this course will suit your needs. Les renseignements fournis dans le cadre de ce cours concernent surtout le palier fédéral et peuvent ne pas tenir compte des différentes règles fiscales auxquelles sont soumis les résidents du Québec. Nous vous encourageons à communiquer avec nous à l’adresse info@newschooloffinance.com pour obtenir de plus amples renseignements avant votre inscription, afin de vérifier si ce cours vous convient.